How will the growing political influence of the LDS Church shape the Republican Party and the nation’s immigration debate? I believe the church’s global agenda may prove a counterbalance to isolationist forces in the GOP. Two Arizona contests featuring pairs of conservative Mormon Republican candidates may soon provide some answers to these questions and test my proposition. The race for the seat of retiring U.S. Senator Jon Kyl has sparked a Mormon primary contest. Jeff Flake, an active Mormon and U.S. Representative from Arizona’s 6th congressional district, entered the race several months ago. Flake is a staunch fiscal conservative, a principled opponent of earmarks, and a leading conservative voice in the battle over the federal budget. He’s also an internationalist who has distanced himself from immigration hardliners, and his libertarian orientation has turned him into a strong critic of trading and travel restrictions on Cuba. In August, Wil Cardon entered the race to challenge Flake for the Republican nomination. Cardon is a fellow Mormon, family friend, and former political supporter of Flake’s. In fact, as McKay Coppins reported in The Daily Beast, the two attended the same Mormon congregation for a time. Cardon, though, is running as a nationalist, adopting a hard-line anti-immigration stance and courting Tea Party backing. Both men will seek the support of their fellow Mormons, who account for less than 10 percent of Arizona’s population but still constitute an influential constituency in the Arizona Republican Party. The second intriguing race getting national attention is the heated recall election of State Senate Majority Leader Russell Pearce, the chief sponsor of SB 1070, the controversial Arizona law that made illegal immigration a state crime and directed local police to investigate residents’ immigration status. The law has since become a model for other states. But Pearce’s outspoken views have upset enough constituents back at home to earn him a spirited battle for his job. Pearce’s recall challenger is Jerry Lewis, a local charter school administrator. Lewis has held prominent local leadership positions in the LDS Church and served as a religious instructor at both the high school and college levels, making him well-known among the area’s Mormons. Though conservative, Lewis is more moderate than Pearce on immigration, favoring the Utah Compact. That document, endorsed by the LDS Church, calls for “a humane approach” to the reality of immigrants’ presence, a recognition of the positive economic contributions of immigrants, and an effort to keep families together. The LDS Church’s statements in favor of more moderate immigration legislation in Utah have become something of a hurdle for Pearce, who must avoid the perception that he is at odds with his Church. When asked at a recent town hall meeting whether his views conflicted with the Church’s position, Pearce defensively stated that he had consulted with LDS leaders in Salt Lake City and been assured that they did not oppose his approach. Because the Church has declined to comment specifically on SB 1070 or Pearce’s recall, its members will have to decide for themselves how to reconcile their religious and political views. With immigration serving as the main distinction between the Mormon candidates, the recall will provide the clearest indication yet of whether the Church’s immigration stance is swaying its members without a direct institutional effort to command their obedience. The contest for Arizona’s U.S. Senate seat is also likely to become a referendum on immigration policy, testing the strength of nationalism and internationalism, both among Mormons and within the Republican Party more broadly. Since the Republican primary victor will probably become Arizona’s next U.S. Senator, the outcome will have a more direct impact on future federal immigration legislation. Mormons promoting a hard line on immigration can find some support in their church’s history and theology, even if they are out of step with their current church leaders. 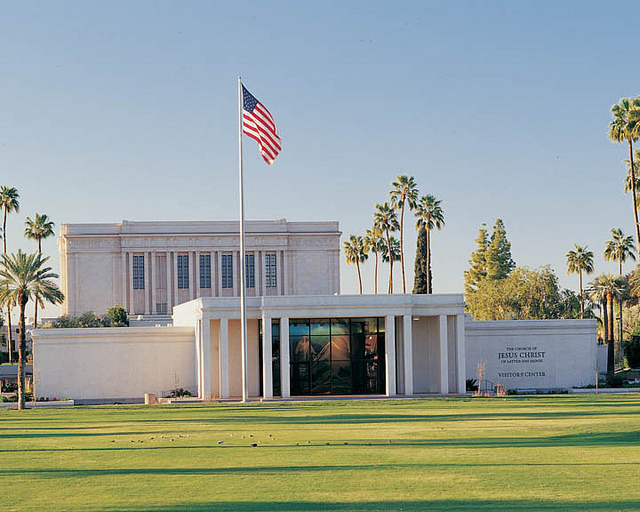 The Book of Mormon, the faith’s foundational scripture, proclaims a favored role for the United States as the chosen land. Ezra Taft Benson, who served as Dwight Eisenhower’s Secretary of Agriculture, was among the more outspoken Mormon conservative nationalists to maintain that God had set the United States above all other nations as an instrument of His divine plan. More recently, Mormon convert Glenn Beck has been active in spreading this religious nationalism to his Tea Party audiences. If the American nation is a sacrosanct instrument of God’s will, it isn’t a stretch to then consider preserving the nation’s essence, not to mention its territorial integrity, a spiritual–as well as a political–imperative. This is a starkly different worldview from the one espoused by contemporary Mormon leaders, who are less likely to view the rest of the world as a threat and more likely to see in it an opportunity for future growth. The LDS Church explicitly supports legislation allowing undocumented immigrants “to square themselves with the law and continue to work” in the United States and claims such a policy approach flows from the church’s moral teachings to love thy neighbor. Watch the election returns next week out of Arizona to see whether those teachings have much sway among conservative Republican primary voters. Jason LaBau is a postdoctoral research fellow at the Huntington-USC Institute on California and the West (ICW). He is currently at work on a book project, Phoenix Rising: Arizona and the Enduring Divisions of Modern Conservatism. *Photo courtesy of More Good Foundation.